The cafetiere is a much under-rated and under-used way of making coffee. Very few places will offer you a cafetiere of coffee, which is a shame since it’s an excellent way to make great coffee. It’s also very simple and if you’re making coffee at home, I’d recommend it: it’s my method of choice for making coffee if I’m not having espresso. Grind the beans, put them in the cafetiere and pour on freshly boiled water. Then, around four minutes later, press the plunger and voilà, you have great coffee. The trick with the cafetiere is timing the plunge, which depends both on your taste and on the beans you’re using. Like tea, you need to give it enough time to brew, but you don’t want to leave it to stew. If you are lucky enough to be somewhere which offers a cafetiere of coffee, there’s one tell-tale sign to look for: has it been plunged? If the cafetiere arrives with the plunger up, then all’s well and good. If it arrives pre-plunged, then the chances are someone’s just poured the water in and plunged it there and then, giving it no time to brew. Given how I waxed lyrical on the perfection of a good espresso, you could be forgiven for asking why I’m so keen on using a cafetiere to make coffee. Good question! The answer is that coffee serves different purposes at different times of the day. There are plenty of times when I want a long drink, rather than the short punch of an espresso. Mornings are a good example: very rarely will I drink espresso in the morning. So why the cafetiere and not, say, a latte, or filter coffee? Well, for me, lattes, cappucinos and the like are as much about the milk as they are about the coffee. With the cafetiere you can get much more subtlety and variety. As for filter coffee, well, the simple truth is that a cafetiere makes better coffee than any filter/drip method. With the cafetiere, you have the coffee, water and the container. With filter coffee, you have one more element, the filter itself. If you’re lucky (ie you pay a lot of money) the filter is neutral, otherwise it leaves its imprint on the coffee and that’s rarely good. 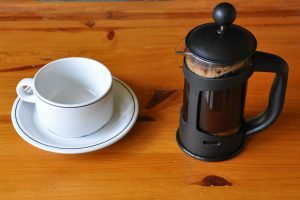 When I switched from a filter machine to a cafetiere, I noticed the difference immediately and I’ve never gone back. The great thing about the cafetiere is that you really can tailor what you’re making to suit your mood. I have one type of bean for the morning (usually a medium roast) and another for the rest of the day. Another mark of a really good coffee spot is if you’re offered a choice of beans for your cafetiere. So, in summary, I drink espresso when I want an espresso and the rest of the time (when at home) I’ll make a cafetiere of coffee. It doesn’t help to think of one as better than the other; they both make excellent coffee and meet different needs.